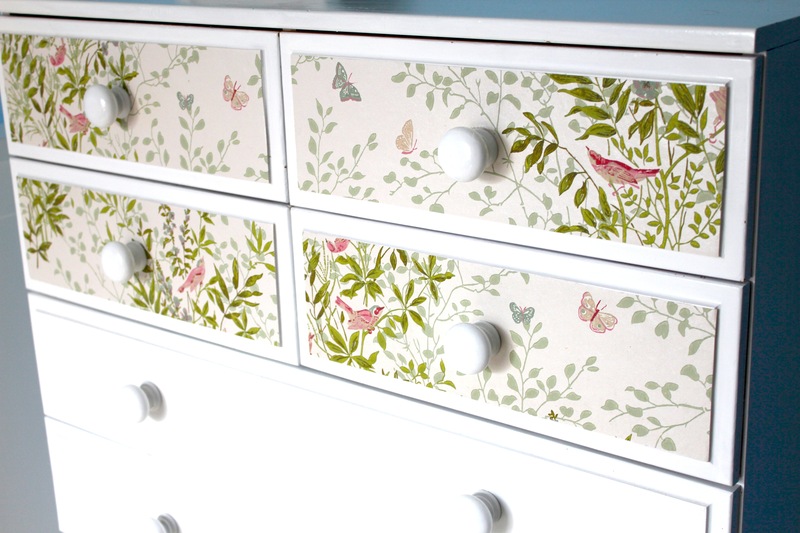 Upcycling – A chest of drawers for the nursery | Hey Bernice! 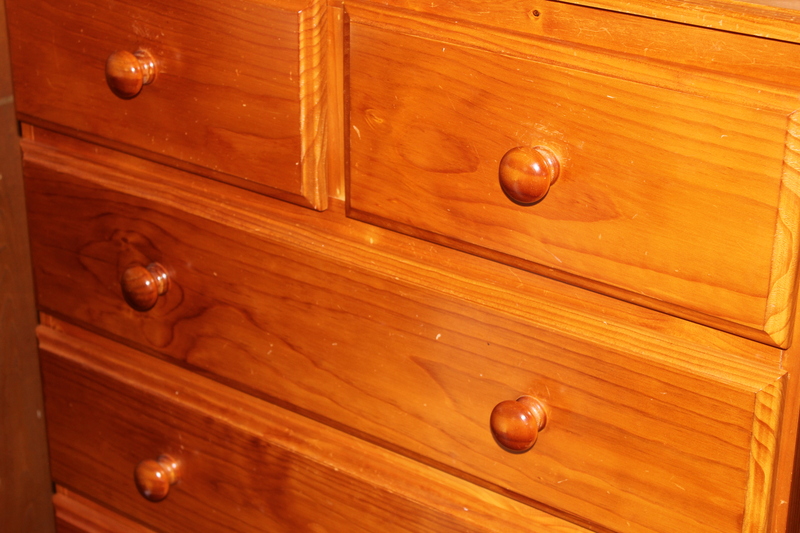 Its usefulness is now being extended … it has been turned into a clothes drawers for the baby’s nursery. Being all white was a little boring, so I decided to jazz it up a little by adding some wallpaper on the front of the top drawers. The wallpaper I used was a donation from Mum about a year ago (I wrote about it in a previous post), I had not found the right use for it until now. 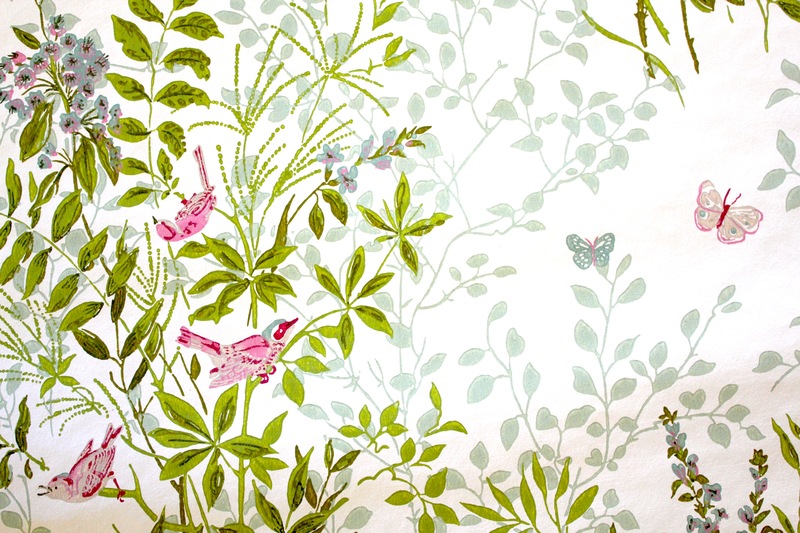 This wallpaper was used in a room renovation in my first childhood home – about 40 years (and 4 house moves) ago! It was only fitting to see it re-used for the arrival of the next generation in our family. Take the drawers you want to cover and remove the knobs (you may need a screw driver to loosen the screw from the inside of the drawer. Measure the dimensions of the area you are covering (the area I covered was the flat surface that started just inside the edge of each drawer). Each drawer could have slightly different measurements, so check this. Cut out the pieces of wall paper neatly. Place then on the drawer to check that they are the right size (before sticking). Use craft glue to cover the back of each piece of wallpaper evenly (if the glue is not covering all the wallpaper you will increase the chance of bubbles or wrinkles as it dries). You can use a paint brush to aid in spreading the glue. Stick the wallpaper onto the front of each drawer, running a ruler over each one to smooth out any wrinkles or bubbles. Allow to dry. When dry you can use a knitting needle/pen etc to poke a hole through the wallpaper to allow the knob screw to go back into place. Screw the knobs back on (be careful that when screwing the knob on tightly that it doesn’t tear the wallpaper. 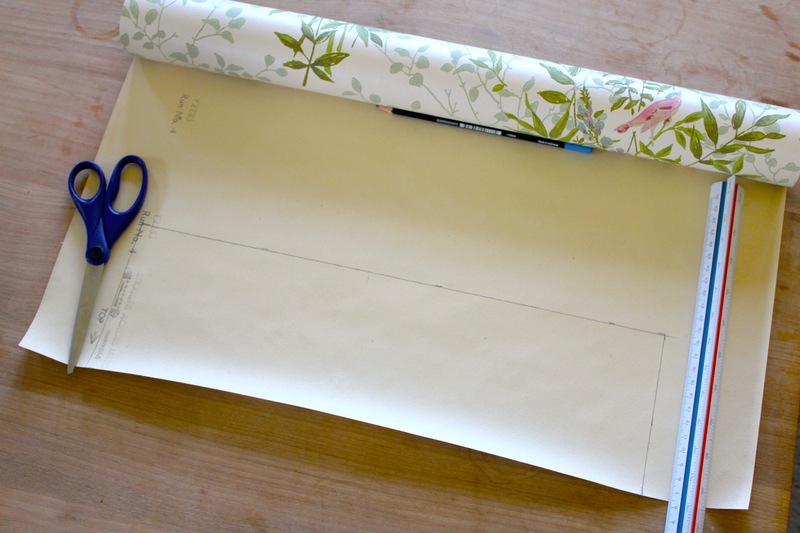 You don’t have to use wallpaper, you could even use material – I just happened to have some, and wallpaper tends to be wide enough for these uses. Be imaginative and use anything you like – you could even collage the front with old book pages, magazines – be adventurous! I LOVE this. LOVE LOVE LOVE. Was very busy prior to having Heidi… set up all the posts to go live over the next month, so I don;t have to try and be creative in between breast feeds! This wallpaper is beautiful, could you tell me where it is from? I know it was donated to you, just wondering if the wallpaper says where it comes from. I wish I had that information for you… ALl I have is the roll, and it says nothing on the back unfortunately. You might be able to do a google images search describing the wallpaper to find something similar? Good luck!